Kali Roberge is a seasoned content marketer within the finance industry. She's worked with numerous financial advisors in order to gain a greater understanding of what people care about most when it comes to personal finance, offering advice about everything from debit and credit to real estate and business. Moving to a new place can be exciting, but also stressful if you're not organized. Having a plan in place and using a moving checklist can make a big impact on your experience in transitioning to a new home. Here's what to think about and do before moving to ensure that the process is as smooth as possible. Attend a First Time Homebuyer (FTHB) Class: If you're using a loan program that requires counseling for first-time homebuyers, you should take the class as soon as possible so that you'll have the certificate in time for your closing and more time to focus on packing. This class will teach you more about the homebuying process. Double check with your loan officer to make sure the class you've chosen meets the requirements for your loan program. Decide If You Need Help: Whether or not you need to hire movers depends on how much you own, how far you need to move your possessions, and how complicated the transition will be. Are you moving to an apartment in Boston where you'll need to walk all of your heavy furniture up three flights of stairs? It might be worth getting experts to do that for you. Having professionals haul your moving boxes for you can be well worth the cost, especially if they can do it faster and safer than you can. However, you may be able to handle the move yourself if you have enough willing hands to help and you don't have too much heavy, bulky furniture to get up and down stairs or through narrow hallways. If You're Not Hiring Movers, Rent a Moving Truck: If you're handling the move on your own, you'll need to book a vehicle to transport your possessions. 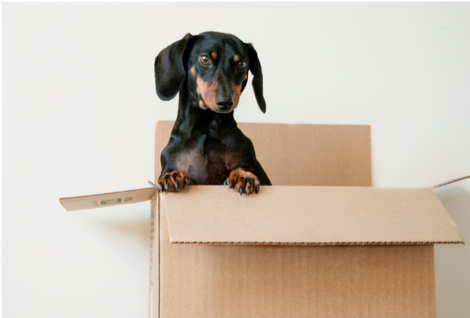 Get Moving Boxes: There are a lot of places, including office supply stores, moving truck rental facilities, or even a store like Lowes or Home Depot, where you can buy cardboard boxes to pack and haul everything you own. But before you spend money on boxes, ask friends and family if they have any that you can use. Check with your workplace, too; you may be able to take home any boxes used to ship supplies and materials. Alternatively, be sure to visit your local grocery store as many will keep cardboard boxes at the front of the store where customers can take them for free. Before you begin packing, go through your entire house from top to bottom, including the exterior and any storage spaces like your basement or attic. Mark every last thing in one of four ways: keep, trash, sell, or donate. Whatever gets marked as trash should be thrown away immediately. If you're going to sell or donate any items, it's best to do this before the actual move. The less you need to move, the easier it will be to relocate—and there's no need to spend time and energy moving things that you don't actually use or enjoy anymore. Designate a specific area to put already-packed boxes so that you can keep your space organized. Plan to begin as soon as possible; if you spread this chore out over a few weeks, it will feel a lot less overwhelming. Begin boxing up outdoor equipment, seasonal items, and anything else that you want to keep but won't use on a day-to-day basis. As you begin packing the main rooms of your home, clearly label boxes with the rooms they need to go to once you arrive in your new home. Request time off from work, if necessary. Contact utility, cable, telephone companies, and schedule dates to turn off services at your old home, and set them up in your new place. File for any moving or parking permits you may need. Make a list of where you need to update your address. This may include your driver's license, bank accounts and credit cards, insurance, and any companies with which you hold subscriptions. Request a change of address packet from the post office and set up mail forwarding. You can also fill out the mail forwarding form here. Before the actual move, ensure that you've found proper care for any children or pets. Having them stay with family or friends will allow you to focus on the move, and may reduce their anxiety. Be sure to keep all of these to-dos in mind before your move—it might even help to start creating your checklist now. The more you can plan and organize your move before it happens, the less stressful your experience will be.